I struggled to get my head around how brothers who claim to love the Lord and His Word could say things as mentioned above. A speech on Saturday morning helped to clarify that question for me. The old way of reading the Bible might be called ‘foundationalism’, describing the notion that you read God’s commands and instructions (eg, any of the Ten Commandments), and transfer that instruction literally into today so that theft or adultery or dishonoring your parents is taboo. This manner of reading the Bible does not go down well with postmodern people, because it implies that there are absolutes that you have to obey. The alternative is to disregard the Bible altogether and adopt ‘relativism’, where there are no rules for right and wrong at all – and that’s obviously wrong. So, we were told, we need to find a third way between ‘foundationalism’ and ‘relativism’. This third way would have us be familiar with the Scriptures, but instead of transferring a command of long ago straight into today’s context, we need to meditate on old time revelation and trust that as we do so the Lord will make clear what His answers are for today’s questions. If the cultural circumstances surrounding a command given long ago turns out to be very similar to cultural circumstances of today, we may parachute the command directly into today and insist it be obeyed. But if the circumstances differ, we may not simply impose God’s dated commands on obedience or on theft or on homosexuality into today. Instead, with an attitude of humility and courage we need to listen to what God is today saying – and then listen not just to the Bible but also to culture, research, science, etc. After prayerfully meditating on the Scripture-in-light-of-lessons-from-culture-and-research, we may well end up concluding that we need to accept that two men love both each other and Jesus Christ. That conclusion may differ from what we’ve traditionally thought the Lord wanted of us, but a right attitude before the Lord will let us be OK with conclusions we’ve not seen in Scripture before. This speech about the ‘third way’ helped clarify for me why the Kampen professors could say what they did about Genesis 1 and 1 Timothy 2. They were seeking to listen to Scripture as well as to what our culture and science, etc, were saying, and then under the guidance of the Holy Spirit sought to come to the will of the Lord for today’s questions. To insist that Genesis 1 is God’s description about how we got here (creation by divine fiat) leads to conclusions that fly in the face of today’s science and/or evolutionary thinking – and so we must be asking the wrong questions about Genesis 1; it’s not about how we got here…. To insist that 1 Timothy 2 has something authoritative to say about the place of women is to place us on ground distinctly out of step with our society – and so we must be reading 1 Timothy 2 wrongly. As a result of deep meditation on Scripture plus input from culture etc, these men have concluded that God leads us to condoning women in office in our culture, accepting a very old age for the earth, and leaving room for homosexual relationships in obedient service to the Lord. This, it seems to me, is the enthronement of people’s collective preferences over the revealed Word of God. Our collective will, even when it is renewed and guided by the Holy Spirit, remains “inclined to all evil” (Lord’s Day 23.60; cf Romans 7:15,18). There certainly are questions arising from today’s culture that do not have answers written in obvious command form in Scripture, and so we undoubtedly need to do some humble and prayerful research and thinking on those questions. But the Bible is distinctly clear (not only in Genesis 1) about where we come from, and distinctly clear too (not only in 1 Timothy 2) about the place of women, and distinctly clear also on homosexuality. To plead that we need different answers today than in previous cultures lest the Bible’s teachings hinder unbelievers from embracing the gospel is to ignore that Jeremiah and Micah and Jesus and Paul and James and every other prophet and apostle had to insist on things that were “a stumbling block to Jews and folly to Gentiles” (1 Corinthians 1:23). One questioner from the audience hit the nail on the head: the Dutch brethren were adapting their method of reading the Bible to produce conclusions accommodated to our culture. There was a time when the Reformed Churches in the Netherlands and their Theological University in Kampen were a source of much wisdom and encouragement in searching the Scriptures. Given that all the men from Kampen spoke more or less the same language at the Hermeneutics Conference, it is clear to me that those days are past. We need not deny them the right hand of fellowship, but we do need to pray that the Lord have mercy on the Dutch sister churches – for this is how their (future) ministers are being taught to deal with Scripture. I was very grateful to note that the professors from the Canadian Reformed Theological Seminary (and MARS too, for that matter) all spoke uniformly in their rejection of Kampen’s way of reading the Bible. They insisted unequivocally that “the whole counsel of God, concerning all things necessary for his own glory, man’s salvation, faith, and life, is either expressly set down in scripture, or by good and necessary consequence may be deduced from scripture: unto which nothing at any time is to be added, whether by new revelations of the Spirit, or traditions of men” (Westminster Confession, I.6). Postmodernism does not pass us by. May the Lord give us grace to keep believing that His Word is authoritative, clear and true. 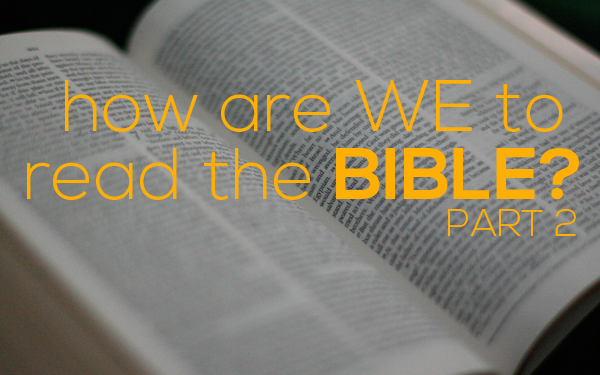 Previous How are We to Read the Bible? Part 1.